Tropical Hideaway is a luxurious boutique style property, offering accommodation in the ‘Tropical Hideaway Villa’, consisting of the fabulous ‘INFINITY STUDIO’ on the lower pool level and an incredible ‘PENTHOUSE SUITE’ encompassing the entire top floor. The spacious ‘POOL HOUSE’ which is fully equipped, has a second mezzanine bedroom and adjoins directly onto the stunning Infinity Pool and ‘PALM and HIBISCUS COTTAGE’ which are both very private and enjoy the most amazing views of the Caribbean Sea. PALM COTTAGE is a very popular accommodation at Tropical Hideaway and offers easy access, privacy and stunning views overlooking Admiralty Bay. Measuring approximately 8m (26’) wide and with a large covered veranda on the front, this accommodation is the perfect choice for two people wanting the luxury, intimacy, privacy and space that your own cottage provides. Palm Cottage is a stunning octagonal shaped studio, is spacious, light and airy and furnished to the highest of standards. A queen size bed complete with luxurious mattress is positioned centrally in the room and ample seating, cupboard and storage space is close at hand. Egyptian cotton bed linens, quality latex memory foam and natural feather pillows, luxury bathroom towel sets, pool and beach towels are all supplied as standard. Two cane and rattan armchairs provide a very comfortable seating area and the panoramic views looking through 24' of glass fronted patio doors are absolutely stunning. The large and private veranda has a bistro dining table and chairs, allowing you to dine ‘alfresco style’ and enjoy the ambiance of the outside environment. The well laid out kitchen has a sink unit, 2 burner gas hob, fridge, combination microwave oven and grille, toaster, kettle, cafetiere, Moka espresso maker, blender and a comprehensive range of high quality cooking utensils, crockery and cutlery. An ice bucket is supplied and complimentary ice is available from the pool bar ice maker or the staff. Tropical Hideaway and Palm Cottage have one of the finest hillside locations on Bequia and coupled with the incredible heated Infinity Pool, the spectacular panoramic ocean views & the beautiful evening sunsets, you soon realize you are enjoying, what many say, are the finest views on Bequia, from the finest accommodation on Bequia. The views are simply amazing and are forever changing as ships and yachts of all sizes and nationalities pass by on their journeys and adventures. Having two dive shops and around 24 dive sites, Bequia is a divers paradise. Our diverse marine environment includes relaxing reefs, wall dives, drift dives and even a few wrecks. You can still dive and snorkel away from the crowds in crystal clear waters with reefs that are still pristine. Our abundant and diverse sea life ranges from 100’s of species of Tropical Fish, Octopus, Sea Turtles and Sea Horses to name but a few. Bequia has it all and will satisfy beginners trying out snorkelling, scuba divers who wish to take a Padi course and experienced divers wishing to go on an exhilarating dive. Looking for an adventure? Try Discover Scuba with one of our two dive shops and enjoy a shallow reef dive with one of their experienced instructors. We now have available our brand new forty page 2016 guidebook about Tropical Hideaway and the island of Bequia. It has detailed information about local services, the fun things to do, our local restaurants, day trips to nearby islands and a wealth of other information invaluable for anyone intending to visit our beautiful Island. To read our complimentary guidebook please go to the very bottom of this page or visit our comprehensive website, read our latest 5* reviews, browse through our stunning photographs and download our complimentary 2016 40 page information guide for visiting Bequia and make your dream a reality. Verandas include bistro dining sets. Dine alfresco style in privacy with beautiful surroundings and incredible views of Admiralty Bay. You can spend hours just looking at the views. Julie and Martin certainly know how to make you feel welcome! As one of the guests said if James Bond was to do self catering he would do it here! Stunning property and lovely accomodating staff. A must for the discerning holiday maker. My wife and I have been regular guests at Tropical Hideaway since 2013. Bequia is by far and away our favorite Caribbean island. And Tropical Hideaway is the absolute best value for our money we have ever found in our extensive Caribbean travel. We go back again and again simply because the owners, Martin and Jule, set the bar so high we know we would be disappointed if we went anywhere else. For us, the real beauty of Bequia is that very few outside the yachting community have ever heard of it. It is a small island that is somewhat difficult to get to for land crabs like us, which effectively eliminates the hordes of tourists who regularly deplane in St. Lucia and Barbados. Those are your two main gateways. To get to Bequia, you have to take SVG Air from those two islands. And for couples like ourselves, that adds another $1,000 to the total trip cost. But the cost is beyond well worth it! Bequia has no casinos, no large hotel chains, no zip lines, no jet skis, no rowdy nightlife, no corporate junk food chains...in essence it is the Caribbean as it was 30-50 years ago. You can take sailing day trips, you can scuba dive, you can snorkel...basically you can have a "real" Caribbean experience and meet local people who are genuinely glad to have you there. The small shops and local bars/restaurants are very inviting and friendly. As for Tropical Hideaway, it is breathtakingly beautiful. Basically a small luxury boutique hotel (without the usual $1,000+ a night charge), the landscaping is lush and vibrant with color. 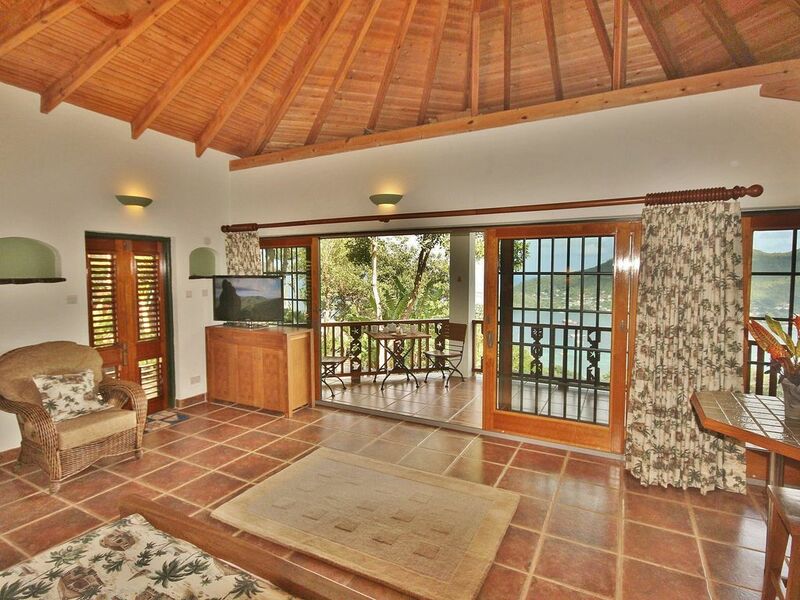 It sits atop Bequia Estates with wonderful views of Port Elizabeth and Princess Margret Beach below. And the infinity pool is THE finest we have ever found in all our years of Caribbean travel. Relaxing with a few of Martin's rum punches (the best on the island) and just enjoying the view from the edge of the pool can and does (for us) consume a large portion of our stays. We've stayed in the Penthouse, the Pool House, and this time we spent part of our stay in the lovely Palm Cottage. Hibiscus Cottage in down the hill below the pool and is the most private. It is basically a duplicate of Palm. We prefer to be close to the pool and eliminate the walk down and up. But lots of people we've met there prefer the added privacy. Everything...from the island, to Tropical Hideaway, to the owners are just beyond fabulous. If you go, you will hate leaving. And you will long to return. This we promise you. Wow! What an incredible place! We had the most magical, relaxing, incredible time. Martin and Julie are excellent hosts and treated us like family. The Palm Cottage was private and spacious with excellent views and just a short walk from the pool. I would highly recommend staying there. The pool is the best one I've ever been in. Every night we watched the sunset from the pool. There is something so relaxing and peaceful about being there. You leave feeling refreshed. If you have the chance to stay here, don't hesitate to do so. You'll love it! Absolutely stunning location. Superb , well equipped accommodation. This property is as beautiful as the views ! Tropical Hideaway is a lovely place to stay, with wonderful hosts! We stayed in Palm Cottage, we had everything we needed, plus more than we could ask for in the scenery. Absolutely, come to Tropical Hideaway ! You won't be disappointed. Outstanding in every detail. The property has a brilliant position, overlooking the harbour and catching the gentle winds. The sunsets over the infinity pool were amazing. Palm Cottage was brilliant for the two of us, with its own private terrace with views over a diffent aspect of the harbour. Would recommend without hesitation and we will most certainly return. For people thinking about booking their website is amazingly comprehensive and is very accurate and helpful.